Hexies are so in vogue these days! Have you ever thought to applique them instead of sewing them together? 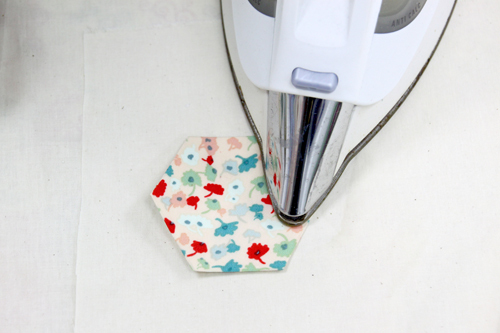 Try my technique of sewing hexies entirely by machine – no hand basting or removing papers later! Two cardboard templates are all you need! 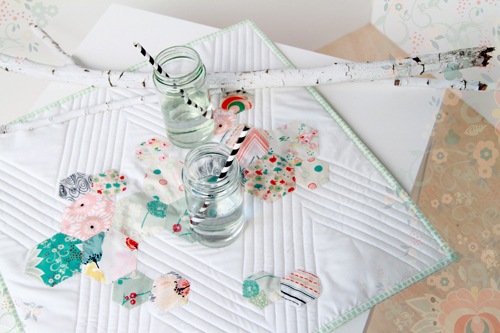 Complete this tabletop with a very modern chevron quilting design… it’s so easy to do! Step 1) Cut the fabric. From the white fabric, cut two 20″ x 20″ squares. From the COLOR fabric, cut one 6″ x 20″ strip; the rest will be used later for binding. 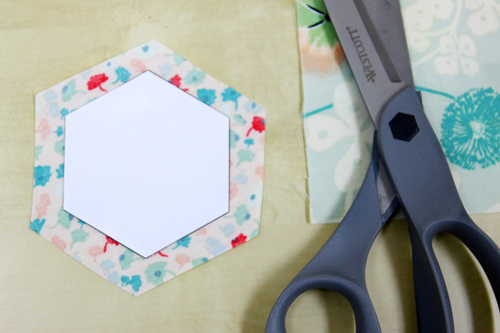 Step 2) Make the hexies. 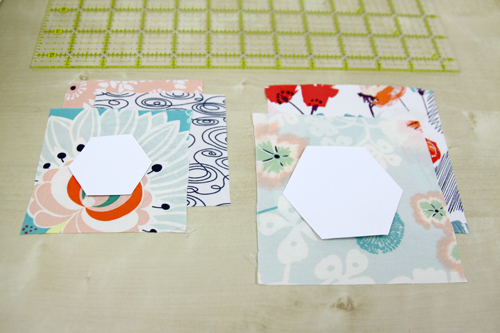 Download and print the hexies templates on cardstock. Cut on the lines. 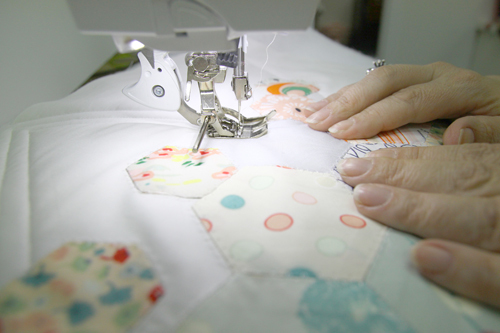 Place one of the 4-1/2″ fabric squares, wrong side up, on a flat surface. 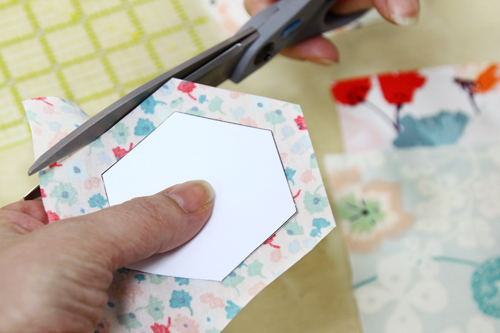 Place a large hexie template on top. Holding it in place with your fingers, trim the fabric around the hexie shape leaving approximately 3/8″ around all sides. Repeat for a total of eleven large hexies. 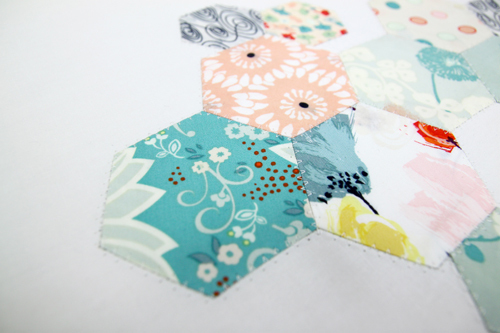 Repeat with the 3-1/2″ blocks and small hexie template, for a total of ten small hexies. Heat your iron to its highest setting. 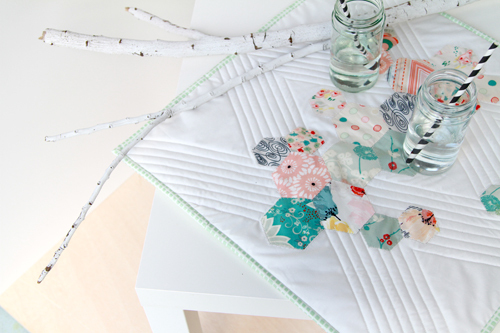 Place one of the large hexies wrong wide up on the ironing board, with the large hexie template centered on top. Fold one edge over and press with the iron. Repeat for all edges, using your finger or a stiletto to hold the edge down as you fold each new edge over to press. Flip the hexie over. Spray with starch and press, leaving the iron in place a few seconds. Remove the iron and wait a few seconds to let the hexie cool off. Unfold 2-3 sides and remove the cardstock template. Repeat for the remaining large hexies. 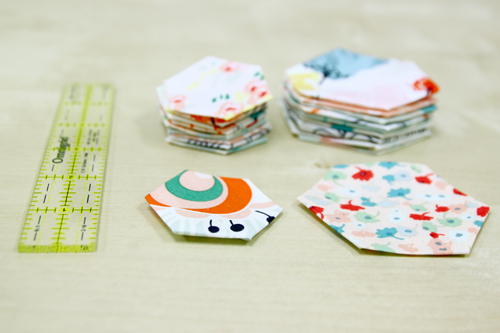 Repeat for the small hexies. Set all twenty-one hexies aside. Step 3) Applique the hexies to the top. 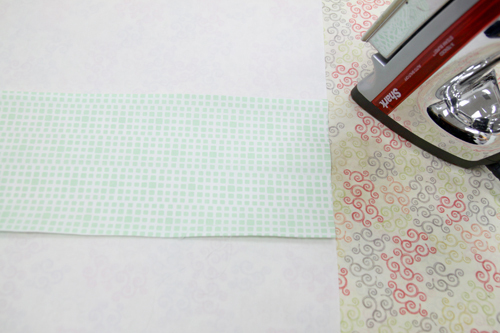 Press one of the 20″ squares, then lay it out on a flat surface. 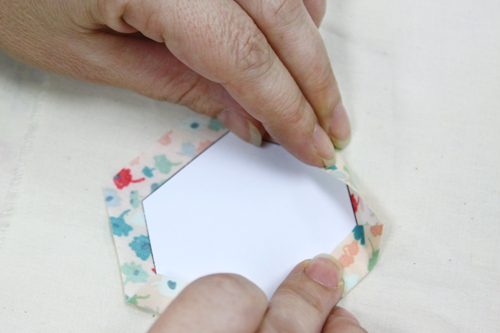 Fold in half, finger-press a soft crease to mark the center, and then unfold the fabric. Place ten large hexies on the square, centered on/above/below the crease as shown in the photo. 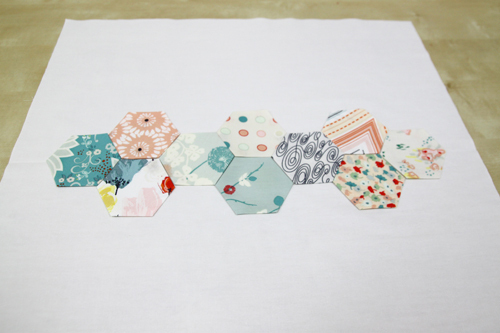 After all the big hexies are in place, play with the placement of the ten small hexies. Pin all hexies in place by inserting a pin in the center of each one, taking care to realign points and edges as needed. Thread your sewing machine with off-white 40-weight cotton thread in the needle and on the bobbin. Select a gathering stitch (#12 on most BERNINA sewing machines; check your machine’s user manual for a similar stitch on your machine). Adjust the width to 4.0 mm and the length to 1.0 mm. Engage needle stop up/down if your machine has this feature. 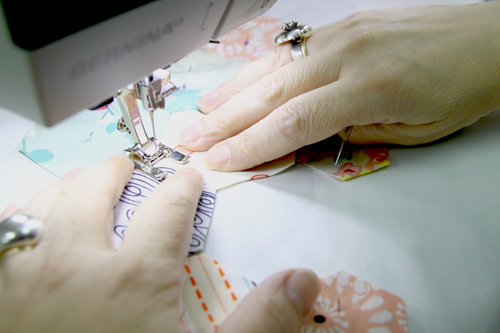 Attach an open-toe or clear embroidery foot to your sewing machine. BERNINA’s Clear Embroidery Foot #39/39C is fantastic! 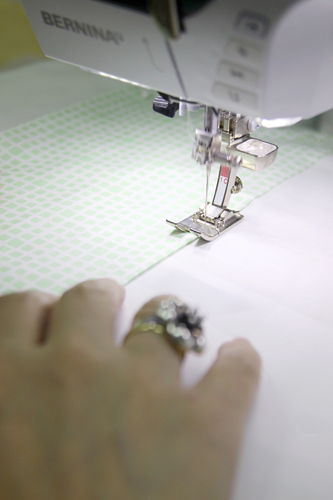 It has a clear acrylic base that lets you see exactly where you are sewing. It also has red center and side marks to help with the alignment of decorative rows of stitches as you sew. Tip: If your machine has a foot selection feature, be sure to click on the presser foot icon and select Foot #20/20C or 39/39C. 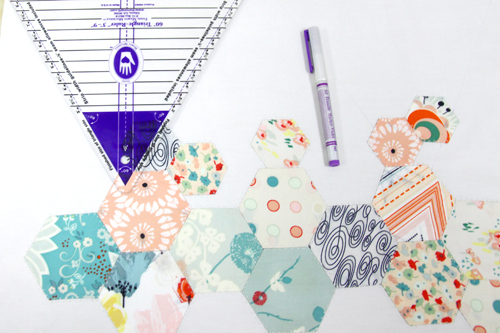 Begin sewing in the center of two adjoining hexies. Start slowly. Aim the needle where the edges of the two hexies meet. 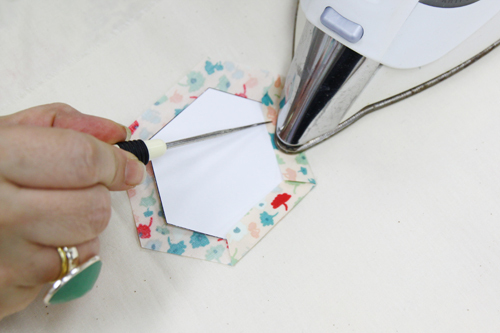 This stitch (the gathering stitch) will catch the edges of both hexies as you sew. Move to the outside edge. 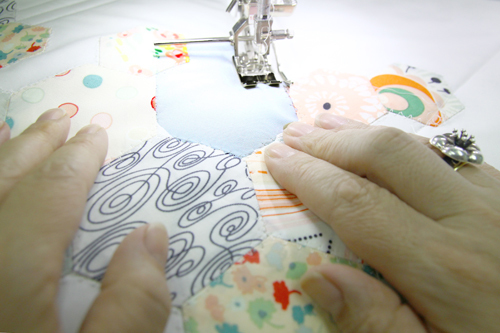 Try to sew one continuous line, as long as possible, without getting stuck in a corner. Tip: Use a stiletto to help hold the edges in place as you sew. When you get to a corner, lift the presser foot and pivot the piece to continue sewing. Tip: To secure all thread tails at the end of the project, leave a 5″ to 6″ tail of needle thread each time you start and end a line of stitching. Later, thread these tails into a hand sewing needle, then pass the threads to the backside of the project to hide them. 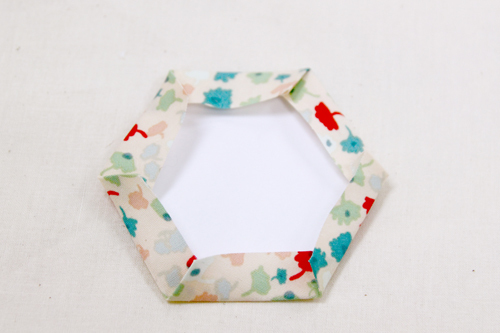 Continue in this manner, sewing all sides of each hexie and removing pins as you stitch. 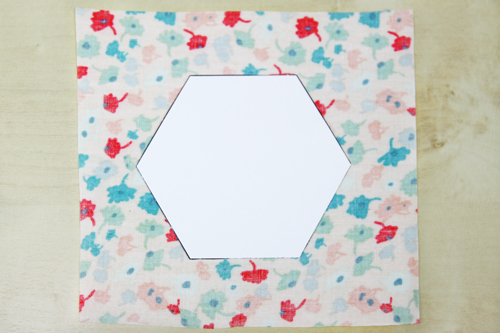 Make sure all of the edges and points of the hexies are lining up correctly down the center of the 20″ square as you continue sewing. 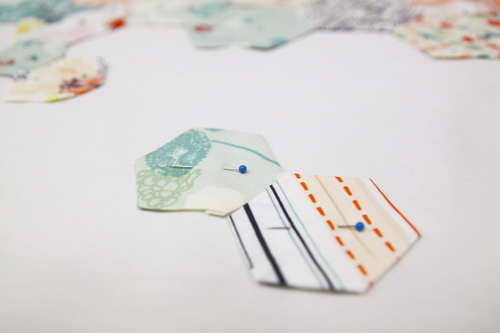 You will find that there are some sections, where the sides of the hexies meet, that you need to close before sewing more of the outside edges. When all sides are stitched, hide the thread tails by pulling them to the wrong side of the project. Press. Step 4) Make the backing square. 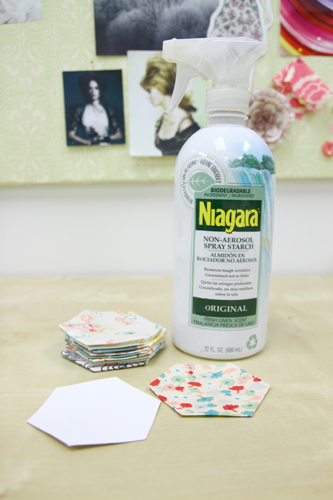 Place the 6″ x seafoam green strip wrong side up on your ironing table and fold in 1/4″ along each long edge; press. 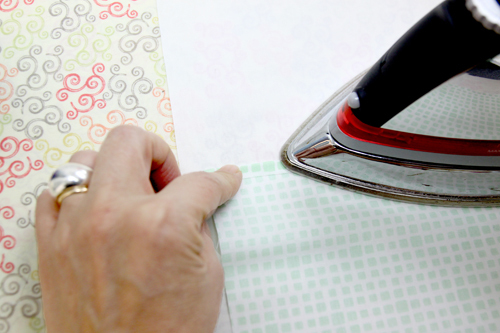 Fold the fabric again, this time in half, and finger-press to make a soft crease. 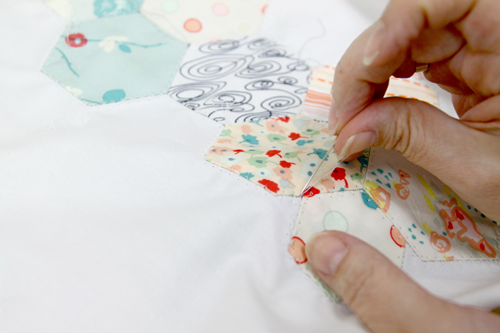 Fold the remaining 20″ square of white fabric in half; finger-press to make a soft crease. Place the COLOR strip right side up on top of the solid backing fabric, lining up the creases. Pin in place. Remove the presser foot and reattach the all-purpose foot. 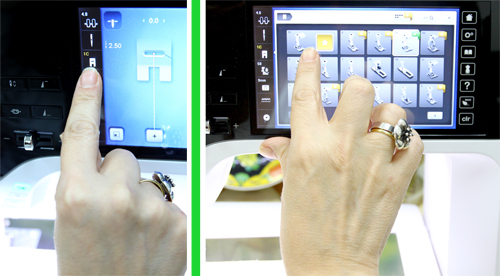 Be sure to click on the presser foot icon and select Foot 1/1C if your machine has this option. Select a straight stititch (#1 on most BERNINA sewing machines). Topstitch 1/8″ inside both long edges of the strip. Change back to the embroidery foot. 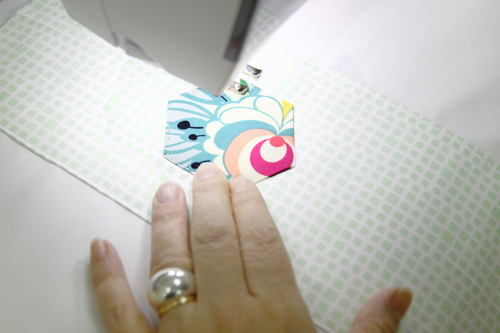 Place the remaining large hexie (#11) on the backing as desired and pin in place. Applique in place like the previous hexies, leaving long thread tails at the beginning and end, and pivoting at each corner. Hide the thread tails; press. 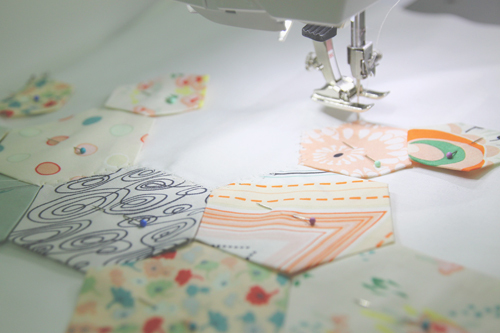 Tip: BERNINA sewing machines have a temporary altered memory feature. This means that when you switch between stitches, the machine remembers the last settings for each stitch you’ve used. 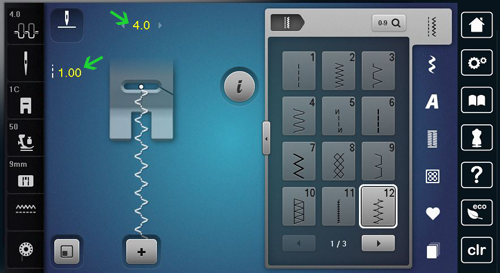 For instance, when you reselect stitch #12 for this project, the machine automatically remembers the 4 mm stitch width and 1 mm stitch length until you change the settings or turn off your machine. Some models, like the B 780, also have a history function that memorizes the settings of the last 15 stitches used, even when you turn off your machine. A real time saver! Step 5) Assemble and quilt the table topper. Select a straight stitch. Switch to a walking foot, or, if your machine has a dual feed feature, engage it. Insert the metal seam guide bar to the back of the presser foot. Adjust to 1/2″ from the center needle position and secure in place. Place the 60 degree triangle ruler on top of the fabric, aligning the base of the ruler with the top edge of the fabric, and draw four line with an air-erasable maker to form a chevron design on one side. Repeat on the opposite side. Position the three layers as follows: Top (right side up), backing (right side down), and batting. Pin. Begin sewing over the first line, leaving a 6″-long thread tail at the beginning of the stitching. 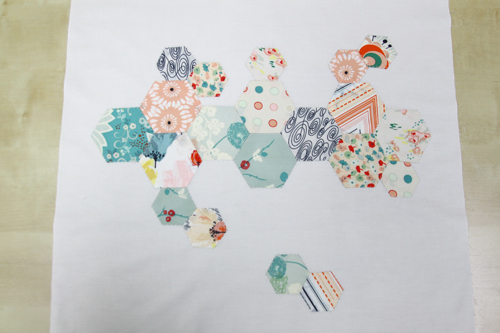 Only sew on the solid white fabric; do not sew over the hexies. When you get to a hexie, stop and pull a 6″-long thread tail; cut the thread. Then place the needle where you need to start again and continue sewing, leaving a 6″-long thread tail at the beginning and end of every line of stitching. Tip: To avoid puckering issues, decrease the needle (top) tension of your machine about 1 point and reduce the presser foot pressure slightly if your sewing machine has this feature. Continue stitching lines, creating a zigzag chevron. (I used eight lines of stitching on my table topper.) Repeat for the other half of the quilt. Hide the thread tails between the layers of fabric. 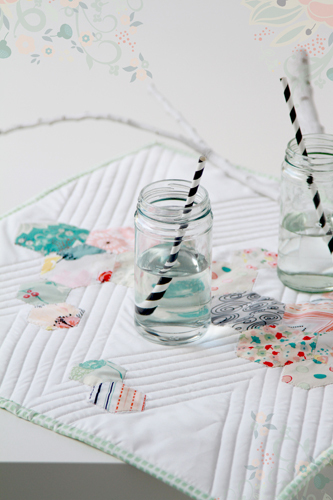 Using the remaining seafoam green fabric, cut binding strips and bind the edges of your table topper using your favorite binding technique. I liked how you wrote this tutorial with the Bernina specifications. Often I don’t use my machine to it’s full capacity and this helps me know what feet, settings, thread to use.